Having a good Gas Stove for cooking food is important for on the stove flame depends the flavour and nutrition value of the food. And when there are guests about to come for dinner, you would a stove that can cook more at a time. 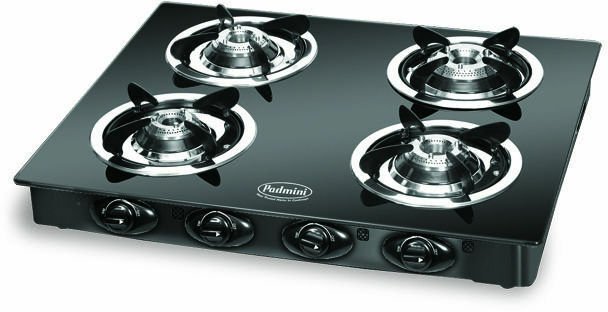 Padmini 4 Burner Gas Stove CS-4BR Cloud is classic Gas Stove by a reputed brand Padmini. It is made up of stainless steel frame, and has stainless steel drip tray. Its 4 Burners are made of Aluminium Alloy. The stove has designer knobs, fire proof film with toughened glass, stain resistant glass top, blue frame, and multi direction Gas Inzet Nozzle. Perfect for large families or cooking plenty of food in little time! Thanks to the four burners that I can cook fast..I ordered this gas burner from here and the packaging was really done in a safe manner!! This is very efficient gas stove...I purchased it last year and it is working very nicely! !